Cryer and Stott Cheesemongers01977 510638work Shop - FoodAt Cryer & Stott Cheesemongers our aim is simple, to be the premier merchant of Yorkshire cheese and produce. Cryer & Stott created the unique Ruby Gold rhubarb cheese six years ago. We wanted to create a local cheese using local produce, and as we are based in Wakefield the obvious choice of flavour was the famous rhubarb. We spent four months working on the project until we found the right texture and flavour that we were looking for. The result was a ewe’s milk cheese with a flaky texture and a lemony zesty flavour that marries really well with the sweetness of the rhubarb. Ruby Gold has become a big favourite with customers in our three shops as well as our wholesale clients (leading restaurants and farm shops). 2005 was the first year we entered any cheese awards and we won a Gold Medal at the Nantwich Cheese Show with the Ruby Gold, as well as picking up an award from the Regional Food Group for Yorkshire and Humber for Business Excellence. Cryer & Stott have received enquiries from all the main supermarkets regarding stocking Ruby Gold, but we want to maintain Ruby Gold’s handcrafted qualities which would be lost in large scale manufacture, instead preferring to trade with retailers and restaurants who share our passion for local food with providence. Ruby Gold is a versatile cheese which can be used in salads and cooking as well as the cheese board. As well as supplying cheeses from a wide range from a wide range of manufacturers, including Wensleydale, Ribblesdale and Shepherd’s Purse, we also make our own cheeses, including Ruby Gold cheese, the World’s only cheese made from our famous local rhubarb. We work with small producers & are the only wholesaler to stock 'The Only Brie Made In Yorkshire ' & small company 'St Helens Goats Cheese'. 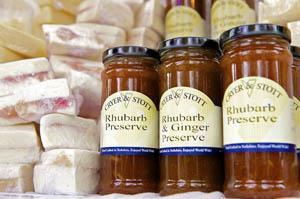 We also sell rhubarb sausages, rhubarb pies & rhubarb chutney in our retail shops. At Cryer & Stott Cheesemongers our aim is simple, to be the premier merchant of Yorkshire cheese and produce.